A fabulous new holiday cottage, set in lovely surroundings and very close to Bowness-On-Windermere. The property is very close to Bowness-on-Windermere which has plenty of shops, cafes, restaurants, supermarkets, banks, post office, leisure facilities including boat hire, cycle hire, cinema. Children welcome from any age. The Lodge offers weekly bookings starting on Friday and short breaks of 3 days starting on Friday and of 4 days starting on Monday in some seasons. Drive down to Bowness (approx. 1 mile) passing the police station on your left and then the cinema on your right, about 200 yards after the cinema before the main road goes steeply downhill and slightly right, turn left up Helm Road, next to the Lakeland shop on the left. Turn right off A591 onto A592. In the middle of Bowness turn left off A592 onto the A5074. After about 50 yards turn right up Helm Road. Once you are on Helm Road, continue up Helm Road passing the Hydro Hotel on your left, fork slightly right where the fork goes steeply uphill, continue straight uphill, straight over a cross roads, straight on until the road forks - take the right hand fork. The Lodge is straight ahead of you on the left and the parking bay is next to the front door. in regards of household appliances and the little things for feeling at home, everything you need is available. 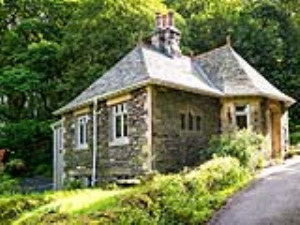 Located in a quiet surrounding above Bowness, a short walk downhill and and you are in the village center. The way back uphill is a nice work out.